At Lakewood Auto Body repair shop, we are more than familiar with the exact science behind matching paint colors, shines, saturations, and textures. In fact our paint technicians are not only the best in the Tacoma area, but with over 50 years of experience in auto body repair and painting, we’re the best in the state. With our experience, technology, and pursuit of customer satisfaction, you wont find a company better at making your auto body repair paint job match exactly, last forever, and be completed on time, than Lakewood Auto Body. Our auto body repair service also comes with a free complimentary auto detail as well, where we carefully wash your entire car, including the new paint, by hand. This ensures that we won’t damage the curing enamel, which wont be completely dry and hardened for a few months. We even vacuum and clean the inside of your car, and will give you valuable information on how best to care for your beautiful new paint job. Did you know that after a new paint job you are not suppose to wax or buff your vehicle for 3 months? And doing so could possibly damage your paint? Many companies will hand you the keys to your car, and after collecting the insurance check, they completely forget about you. At Lakewood Auto Body, we take pride in building a relationship with each of our customers. It is all the little things added on top of our life time warrantied auto collision repair that sets us above the competition, and allow us to say that we are the number one auto body repair shop in the entire Tacoma area. So if you are in the need of an auto collision repair company that can handle both the auto body repair aspect of your situation, and the mechanical repair aspect as well, don’t let your insurance company trick you into going to their special second rate shop. Tell them you are taking your car to a company that works with your best interest in mind and heart. Tell them that you are taking your auto collision repair to Lakewood Auto Body and let us prove that our claims aren’t just talk. 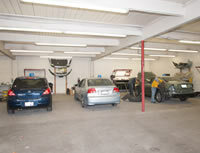 Contact our Tacoma auto body repair and collision center today at 253.581.0220.